This post is second part of my post on Claim based Authentication. This part mainly discusses WIF and demonstrates a sample step by step. You all can access my first post from here. In my last post I discussed the problems of current day’s authentication implementation, details about Claim based authentication and basic components of Claim based authentication. Now in this post, I’ll discuss about Windows Identity Foundation and the main concepts one by one with a sample. Windows Identity Foundation enables .NET developers to externalize identity logic from their application, improving developer productivity, enhancing application security, and enabling interoperability. Enjoy greater productivity, applying the same tools and programming model to build on-premises software as well as cloud services. Create more secure applications by reducing custom implementations and using a single simplified identity model based on claims. Enjoy greater flexibility in application deployment through interoperability based on industry standard protocols, allowing applications and identity infrastructure services to communicate via claims. So we can say, Windows Identity foundation provides a set of classes which facilitates in implementing Claim based authentication. To use WIF you need Windows 2003 server+ or Windows 7/8/Vista. Above templates are available in New Website under File Menu. Identity provider and we’ll use this identity provider for authentication of the user. These are following main steps need to perform. So here I will create a step by step process to create a Custom Identity Provider. Now your sample Identity provider is created. It provides the basic infrastructure for you. It includes one login page that actually authenticates the user and here forms authentication is used. I have created an ASP.NET application as below. Now as this already create a inbuilt authentication module. You can remove it at all because we’ll not be using this. 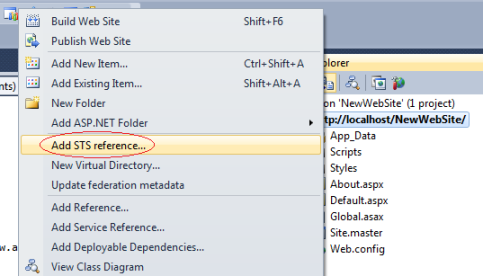 Or you can create an empty asp.net solution and some page as per needed. I have removed the account folder for the demo. If you have not hosted your ASP.NET website(RP) on SSL it will the following Warning. 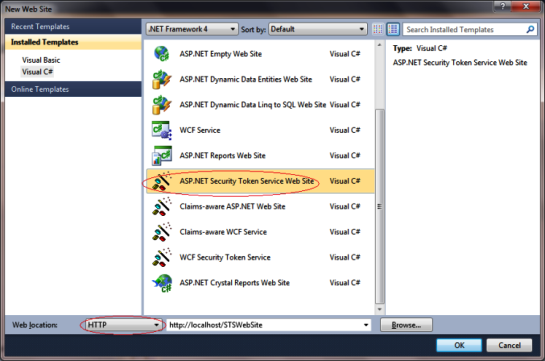 At Production all the communication between Identity Provider and ASP.NET website(RP) should happen over SSL only. Here for demo purpose, I didn’t use SSL. I clicked on Yes. 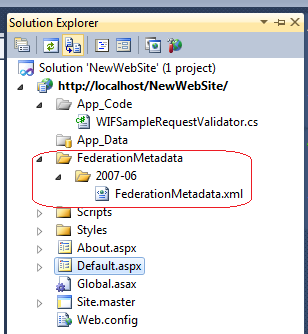 To build the trust relationship, we need to provide the federation metadata provided Identity Provider. Now we need to browse the FederationMetada xml file of the STS that we created. 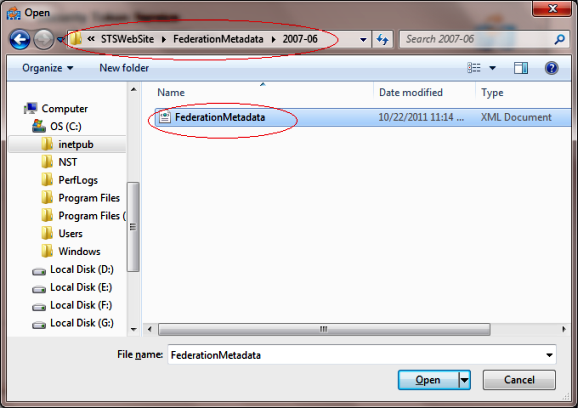 FederationMetadata file resides in a special folder hierarchy “FederationMetadata/2007-06” under the STSWebsite physical folder. Here it asks if one wants to encrypt the token. 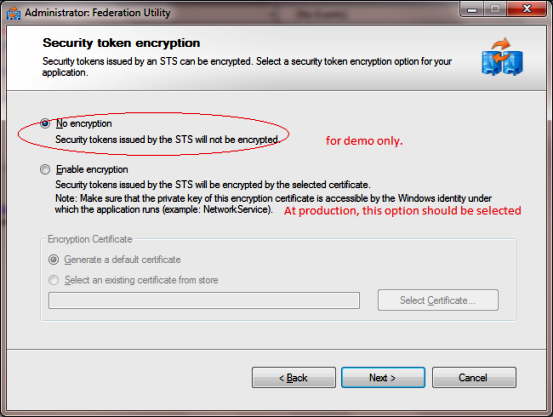 It should be encrypted on production.You require to provide a certificate for the encryption. Here I have selected the option “No Encryption” for the demo. This is the Summary screen, shows the details about STS and RP. One need to review and click finish. 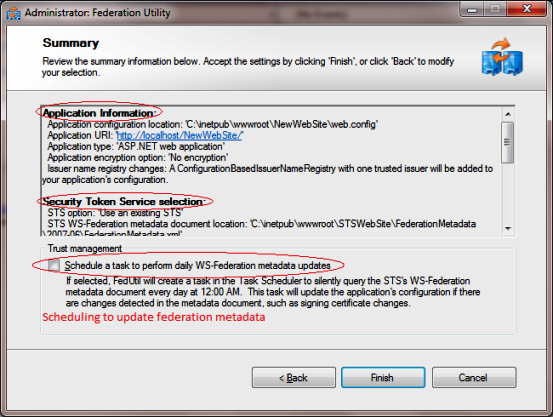 Note: Here There is an option for to update the federation metadata on a routine basis. 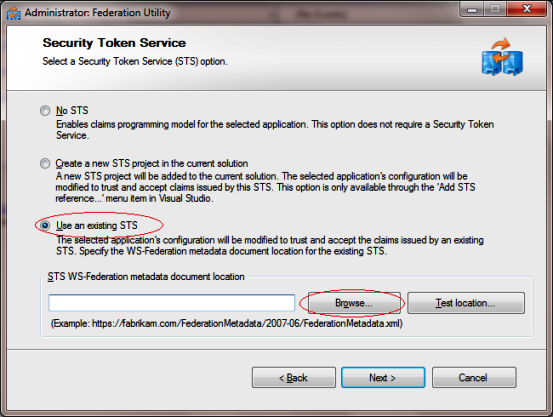 One need to know, if the STS is getting changes say Token or Claims etc. 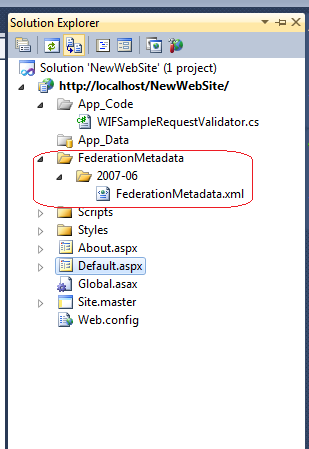 RP would only come to know about when federationmetadata will be updated, else say if someone removed a Claim and metadata is not updated it will allow to get the that Claim but actually at runtime you would nto get that claim which will not be a good condition.One should always have the metadata in updated form. Now after changes it will run smoothly and It will take you at login page that is provided by STS. This is default login page provided STS, here you dont need to write password just put some name and click on login as below. 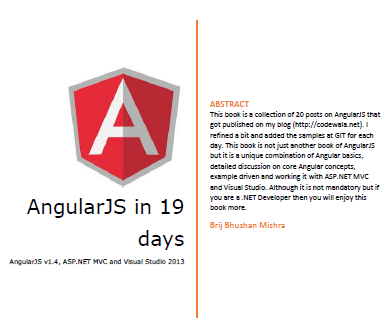 It will redirect to another page to STS which will actually initiate the process to create the token and claims. Then after creating it will be transferred to your website as authenticated user. Now our application is running. As here in STS we have a sample login page the uses Forms authentication and by default authenticate every user. Here we can put our code, whether if we want to authenticate the user using windows authentication/Form authentication and use database this all we can and also we can get some data of the user from any store say DB here and that we can send using in Claims as per our requirement. <summary> /// This method returns the claims to be issued in the token. ///The incoming RST, can be used to obtain addtional information. ///The scope information corresponding to this request. /// If 'principal' parameter is null. /// The outgoing claimsIdentity to be included in the issued token. // Update the application's configuration file too to reflect new claims requirement. I have added two claims (Email, Gender )as above. 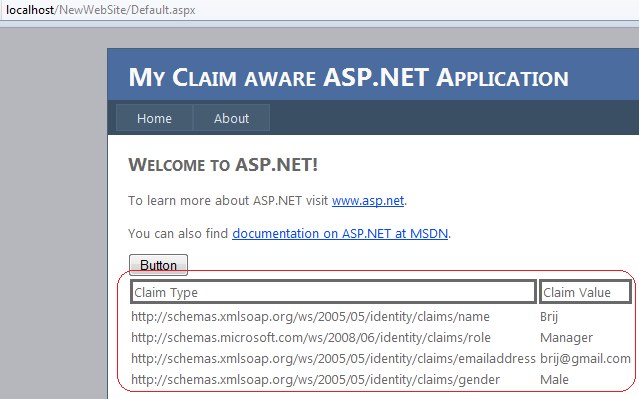 These Claims will be available at ASP.NET website( Relying Party). 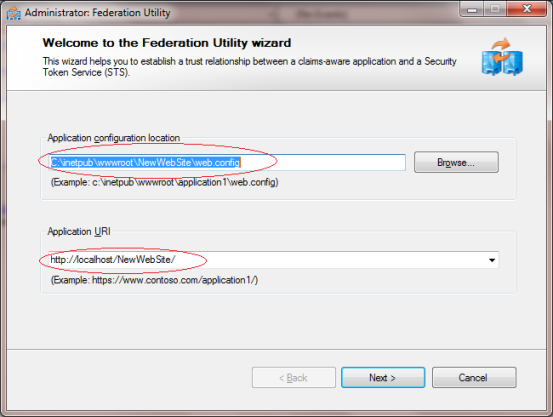 The same Identity provider can be used in multiple application. It’s easy to read the claims at Relying Party. 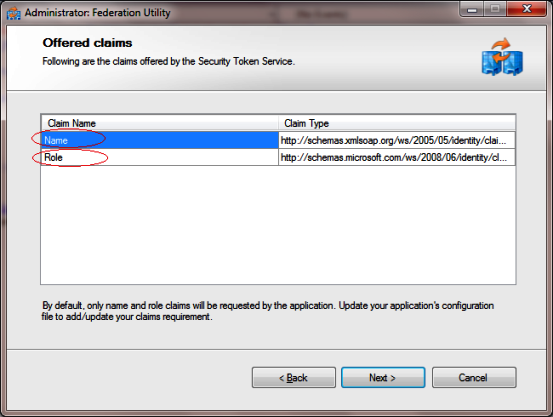 To read the claims you need ClaimsIdentity of the logged in user and it is available in User Property. I have read the Claims at my page. I have created a dynamic table and shown the claim in that. // The code below shows claims found in the IClaimsIdentity. Now you can see that it is very easy to read the claims and this can be used in further processing. I hope the above sample will help a lot. In my new post of this series. I will discuss another technique to implement use Claim based Authentication which is widely Used Called Identity Federation.